I saw this salad on the home page of the Weight Watcher’s website the other day and it caught my eye. Typically, when I’m trying to lose weight I avoid heavy carbs like potatoes… so when I saw this my eyes immediately perked up! It was quite good too… both D and I really liked it. I just served it with a couple of low fat turkey dogs (on WW buns) — for a semi-low point dinner. It would really be good as a side to any summer meat or meatless dish. 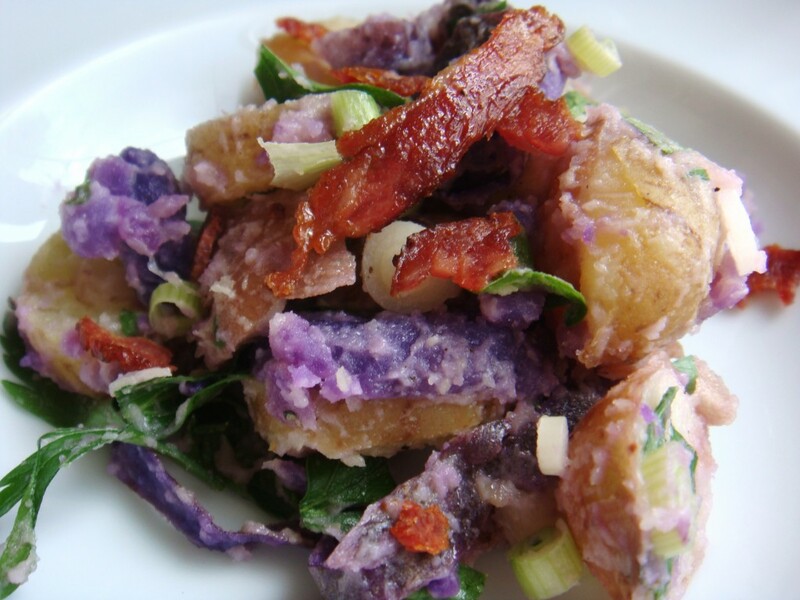 I substituted the suggested red potatoes with a mix of baby red, white and purple potatoes. 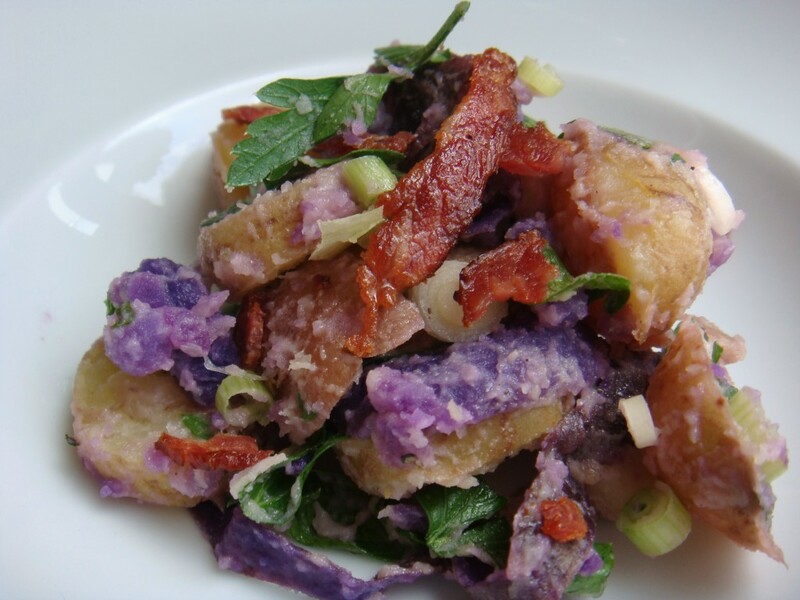 I’m a sucker for purple anything and I especially love purple potatoes because the color is just gorgeous and they add a great dynamic to an otherwise bland looking dish. *I used less mayo and added a little olive oil b/c the mixture was pretty dry. Adjust points accordingly. Place whole potatoes in large sauce pan and pour enough water to cover them; set pan over high heat and bring to boil. Reduce heat to medium and simmer until potatoes are fork-tender (20 to 30 mins); drain. When potatoes are cool enough to handle, slice each into 1/8 — 1/4 in slices. Meanwhile, cook bacon in a hot skillet or microwave until crsip; drain on paper towels. Break bacon into small pieces. In a small bowl, combine mayo, vinegar, parsley, salt and pepper (and olive oil). Transfer cut potatoes to large bowl; add bacon and scallions. Toss with dressing until coated. Yields about 3/4 c per serving. You could easily make this dish vegetarian by omitting the turkey bacon or by using veggie bacon. I didn’t want my bacon to get soggy, so I actually kept it separate from the salad and just broke it up and sprinkled it on top as I served it. One mistake I made was not watching the water level when boiling the potatoes. The purple potatoes were larger than the others and at one point the water level came down below the top edges — causing three of them to explode (rendering them mushy and useless). I think you could also easily transition this salad into a more German version, by adding stone ground or Dijon mustard. I almost did that… but opted with just adjusting the mayo/oil/vinegar amounts instead (to meet my tastes). Oh, and for those of you who think turkey bacon sounds gross… just look at this picture! Would you even KNOW that it wasn’t “real” bacon??? I think not. You just need to be the right kind of turkey bacon… the stuff that’s made with sliced turkey — rather than processed (or peiced together) turkey. Makes a HUGE difference.